Instant downloads of all 942 LitChart PDFs (including Ordinary People). 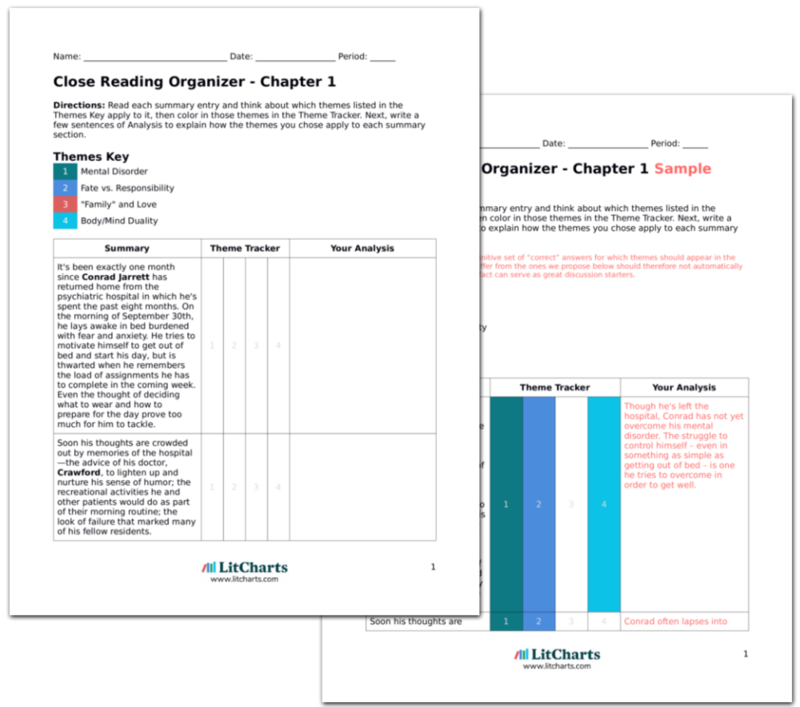 LitCharts assigns a color and icon to each theme in Ordinary People, which you can use to track the themes throughout the work. Ellen scolds Conrad as he comes into the kitchen for breakfast. He hadn't come home from his date with Jeannine until 1:30 am. He answers with a typically jokey comeback. He is in a good mood; his date went well (even after he ran into Truan), and the thought of seeing Jeannine later enhances his happiness. Everything around him looks bright and new, and in the moment Conrad realizes that "he is strong, he is able, because he is." Conrad is acutely aware of the sights, sounds, and feelings of the morning after his date. His grandparents' kitchen is filled with golden light, which points to the strength with which Conrad's newfound truths dawn on him. He is most satisfied when he allows himself to feel freely, without worrying about control or embarrassment. Later that evening, Conrad is still basking in the glow of his good mood. As he leafs through the newspaper he glances at the horoscopes, wondering how to describe his own life and quickly remembering that Berger describes it as "becoming." But an article further down the page thoroughly shocks him: it reports that one Karen Susan Aldrich had committed suicide the day before. Conrad goes numb. A feeling of sickness gradually overtakes him; he excuses himself from the living room and goes up to his room. As he lay stiffly on his bed, garbled memories of his time with Karen in the hospital fill his mind. Conrad encounters his biggest struggle just as he sheds the restricting ideas about truth, guilt, and fate that have influenced him throughout the novel. But his intense feelings have prepared him to handle it, even if he doesn't realize it at the time. Conrad is now in touch with his body and is willing to keep in touch with his feelings. Conrad endures a feverish series of dreams. In the first, he struggles against a crowd of doctors in the hospital as they inject him with an unknown fluid. He is terrified at first, but Dr. Crawford (here called Leo) stays with him as he is taken back to his room. Eventually he calms down. Conrad is jolted awake; he looks around and realizes that everything in his room is blue. In the next dream, Conrad revisits the moment he slit his wrists. In his dreams, Conrad comes face-to-face with the ideas and possibilities that frighten him the most. Unlike before, however, he is no longer able to escape them. These dreams are a point at which Conrad honestly begins to process his hang-ups. The second time he wakes, Conrad jumps out of bed and leaves his grandparents' house. He takes a walk in order to clear his head. Karen's death reminds him of the newspaper article about his own suicide attempt; Crawford had let him read it in the hospital. Suddenly Conrad stops in his tracks as he notices a car approaching him in the darkness. A cop emerges to ask what he's doing out so late, and Conrad answers that he's just out for a walk. He provides his name and his grandparents' address at the cop's urging, and after a while the cop urges him to head home; there are "too many nuts in the world" for it to be safe at night. Conrad's vulnerability allows him to connect with his deceased friend, but not in the pleasant way it does in his relationship with Jeannine. He glimpses the difficulty of deep relationships. At the same time, he learns that many social relationships are only superficial; they disregard the messiness of emotion. Conrad is surprised that simply looking a certain way can prevent others from noticing his mental troubles. Get the entire Ordinary People LitChart as a printable PDF. Back at his grandparents' house, Conrad gets a glass of water from the faucet and washes his hands. He soon heads to the living room and settles in an armchair, where he falls asleep. He has a vivid dream: he and Buck are on Lake Michigan, struggling to hoist the sail of a small boat as a storm whips around them. The sail collapses and tips the boat. Buck and Conrad struggle to hold on to one another in the freezing water. They cannot see one another, so they periodically they call out to make sure the other is still there. We get to relive the novel's defining moment along with Conrad. The symbol of water also returns to its source, as it is connected to Buck's drowning. Seeing the connection suggests a little of what's to come in the climatic breakthrough in the next chapter. Two voices cut into his dream. First, his brother's, asking him why he'd let go of him in the water. Second, his grandmother's, at the funeral, wailing that Buck was not ready to die. Those thoughts had stayed with Conrad after his brother's death; the intense guilt drove him to punish himself for letting his brother drown. He realizes that nothing he could do would change the outcome of the accident – and for a moment he wishes that Buck had dragged him down with him into the water. The voices from Conrad's past make him realize that he was not to blame for his brother's death. As Berger noted several times before, Conrad's guilt was self-inflicted, and did nothing to change the outcome of the situation. Conrad is jolted awake. He turns on the living room TV to keep himself from falling asleep again, and as he stares at the snowy noise on the screen he begins to weep. Soon the sun begins to rise, and Conrad gets up to search for Berger's number in the phone book. He asks to meet with the doctor right away. Conrad's environment continues to reflect his mental journey. His breakthrough is imminent. Brannum, Barry. "Ordinary People Chapter 26." LitCharts. LitCharts LLC, 15 Dec 2013. Web. 20 Apr 2019. Brannum, Barry. "Ordinary People Chapter 26." LitCharts LLC, December 15, 2013. Retrieved April 20, 2019. https://www.litcharts.com/lit/ordinary-people/chapter-26.